Recently the great investor Warren Buffett gave an interview on CNBC and proclaimed that index fund still make the best retirement sense 'practically all the time'. Does it make sense? Will investors be better off buying and index fund as opposed to managing their portfolio actively or giving it to a so called pro to help them manage? 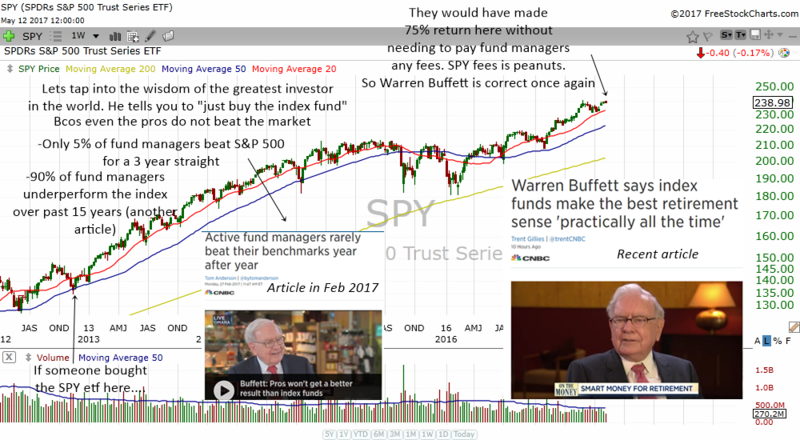 In order to really know whether what Warren Buffett says is true, we need to look at hard data facts and study some charts of index funds. I highly recommend that you read these 2 articles that are on CNBC. After reading this, you will get an idea how much fund managers and mutual fund under perform the market and why the greatest investor in the world prefer "you" to invest in an index fund. CNBC headlines cropping are from the 2 CNBC articles above. Take some time to read it if you have time. The S&P 500 index which measures the performance of the stock market in United States has a long history. What is surprising is that it also has a long track record of performing extremely well over time. 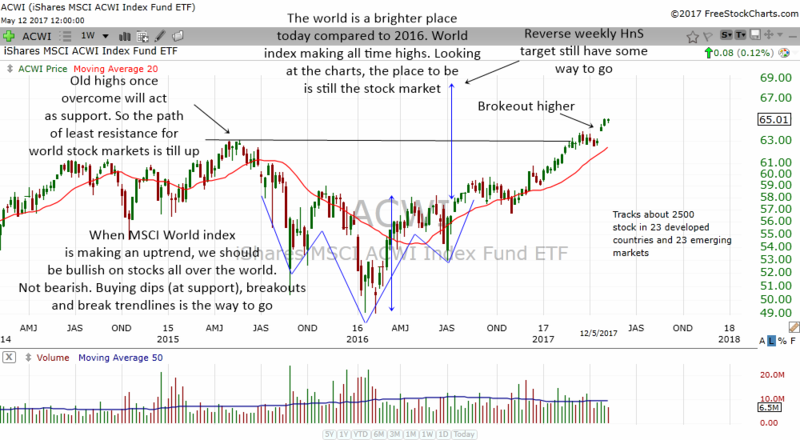 Through boom and bust, bull market and bear market, the index has eventually made new highs and continue to zoom higher beyond the expectations of many. *do note that the value may change since the time of this article is published. So, what this means is that a good fund manager that you invest in will need to give you at least 11% annual returns to beat the S&P 500. When you pay a fee for someone to manage your money, the least to expect is for the fund manager to beat the market by a small margin. However, from what you have read in the articles in CNBC, 90% of fund managers will under perform the market in a period of 15 years. Therefore, it is not surprising that Warren Buffett advises you to invest in an index fund like the SPY. In order to believe what someone says is true or not, you gotta look at their track record. Although no one disputes that Buffett is the best investor in the world, it still helps to shape our thought just by looking at his performance over the years. In the same period that the S&P 500 gave 75% return to investors, Warren Buffett gave his investors a return of about 91%. So, Buffett beat the market during that time. Since 1991, Buffett gave his shareholders a return of 4300% return. So, his authority is established and Mr Buffett definitely knows what he is talking about. The question now is how do the ordinary investor choose the best index funds to invest in? Since we are not picking individual stocks, it save us a lot of problem on choosing which stock to buy. Imagine trying to sift through 10,000 stocks a year just to buy the best ones. In the early days when ETF's are few, investors only have a handful to choose from. But today, there are at least 2000 ETF's that are on my screener. Some are not even worth it to look at because of the liquidity issue. 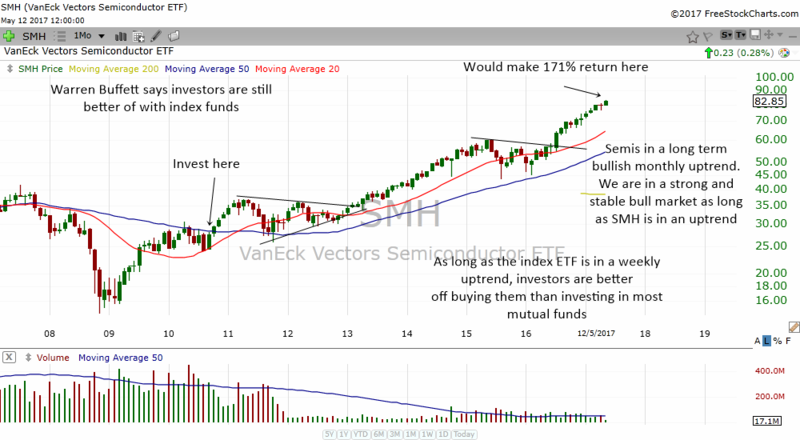 Once the ETF drops below its weekly 20 MA and 50 MA, you should start to think of selling it or finding something else to invest in. 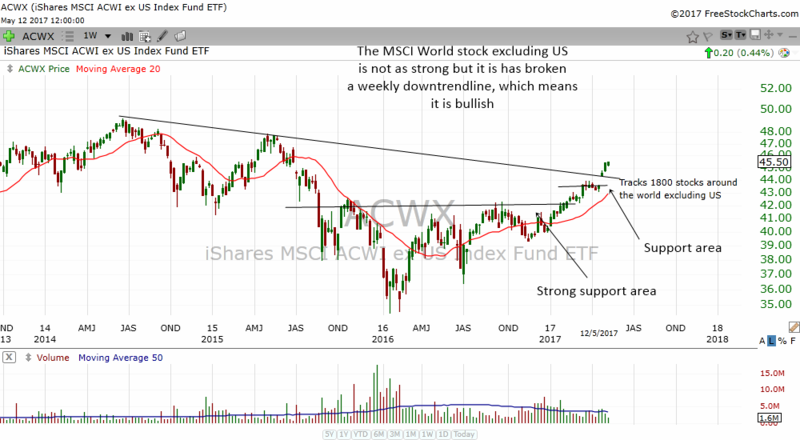 As you can see from the many index fund above, when they are in an uptrend and are above their weekly 20 MA and 50 MA, they are extremely well for investment purposes. From now on, you will not need to crack your head to find the best stock to invest in. Just choose the best ETF and put your money into it. There are at least 6 reasons why the SPY will continue to go up in the long run. It has a long track record of good performance giving investors 8-10% return from 1871 to 2016. How long a track record do you want? 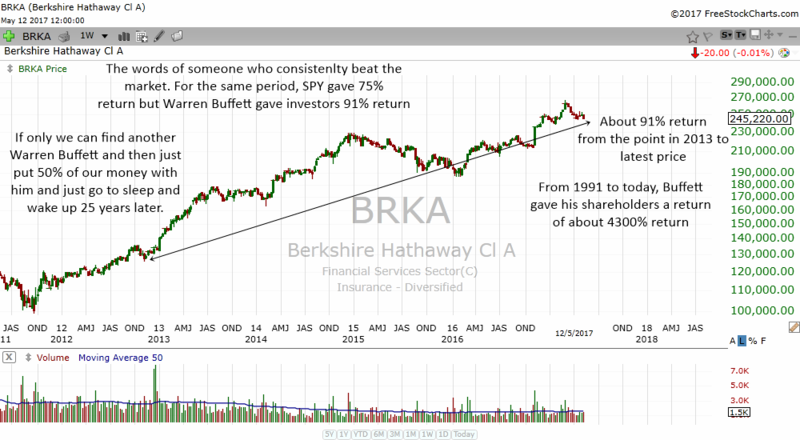 Even Buffett does not have that long a track record. If something has been going up for more than 100 years, you better not bet against it. S&P 500 companies are run by some of the smartest business minds, CEO, CFO and managers in the world. With such great minds and geniuses, they are always able to turn their company around and make even more money in the long run. The S&P 500 regularly kicks out non performers from its index. Every now and then a bad company will be replaced by a better one. 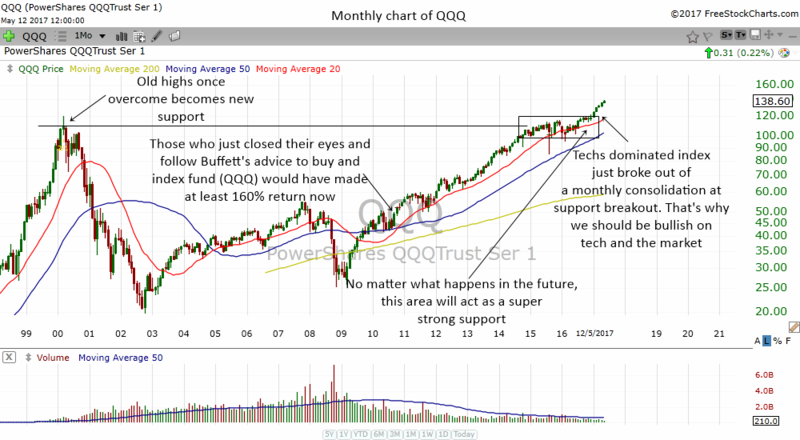 Therefore, the bad apple is thrown out while a great company that will make lots of money is going to be put inside the index and help push the index higher. 30 years ago there was not Facebook. Today this great company is part of the 500 greatest and biggest company in the world. A truly exclusive club of out performers. S&P 500 companies has not stop growing. More and more of its revenues and earnings come from outside of the United States of America. I think at least 50% of its revenue comes from overseas. So, not only does it get it profits from America, these companies benefit from the population demand from other continents and countries. Think of all the money Apple made from Chinese Iphone fans. Which brings us to the fact of a growing population around the world. Years ago, we had 6 Billion people, today we are talking about earth's population possibly surpassing 8 Billion people soon. With a growing population and a growing middle class, the potential of increased profits from overseas are even bigger for these S&P 500 companies. Some may not know that the stock market is actually a hedge against inflation. If you don't understand what inflation means, just think about the $10,000 that you save 10 years ago. Compare what it can buy 10 years ago to what it can buy today. Makes sense now? Inflation is a big monster that the stock market can help to tame. The smaller the purchasing power of your USD, the higher the S&P 500 will go to compensate your lack of buying power. 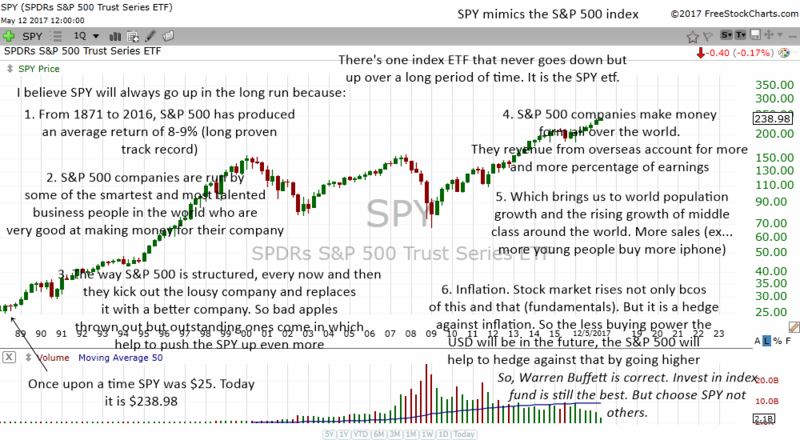 There is of course a 7th reason why you should buy SPY and invest in for the long term. Warren Buffett says so. If you don't accept the advise of the world's greatest investor, who would you want to follow?